For 15 years, Maureen has been saying that Garfield will be the place to live. Dana and Kim, founders of Alwun House Foundation and restorers of the imposing Alwun House on the corner of 12th Street and Roosevelt, have been saying that for twice as long. Then there’s Don, reluctant skeptic, who is slowly coming around now that small proofs of Garfield’s resurgence are appearing with more frequency. One of those successes is the new Portland 38 condos near 7th Street, where most of the units have already found buyers at an average price of $200,000. Who’d have thought? Another example is the green remodel of a foreclosed property on McKinley near 15th Street. That one had a buyer while work was still underway. The greater Garfield neighborhood is about one square mile, stretching from the I-10 to Van Buren, from 7th Street to 16th Street, and holds two historic districts–Garfield and North Garfield. Both districts were placed on the National Register of Historic Places in 2010, another success for the neighborhood. There have been intrepid souls living in Garfield for decades, but the number of them seems to be increasing of late. They are turning ramshackle rentals into charming abodes that students at the new downtown ASU and U of A campuses can afford to own. 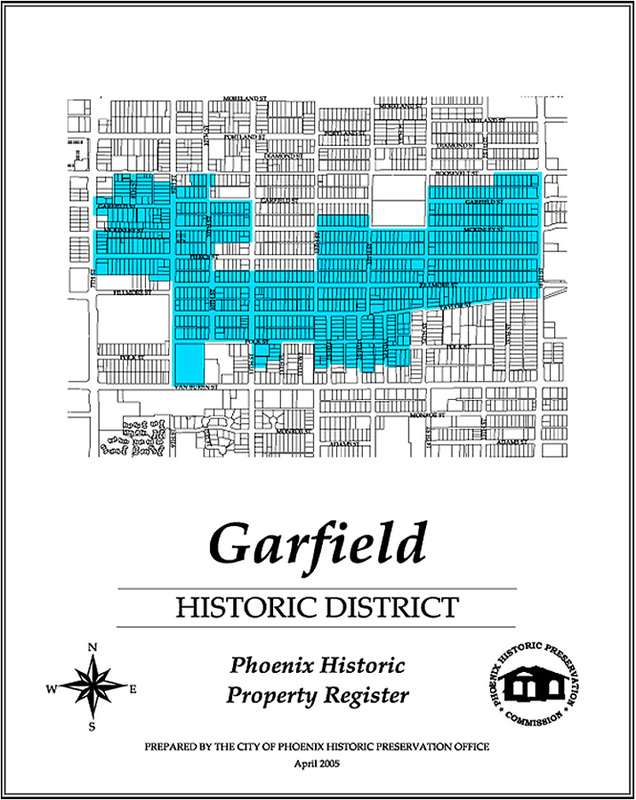 Garfield and North Garfield are still two of the most affordable historic districts in Phoenix, especially if you are willing to do some remodeling and restoration yourself, and they put you about as close as you can possibly be to downtown. The neighborhood is walkable to Roosevelt Row and First Friday happenings, Chase Field, the science and children’s museums… to everything downtown really. Should you feel the need venture farther than your feet will take you, bicycle over to the light rail and go! Square footage is all over the map in the Garfields, from modest Bungalows averaging 800 square feet to Period Revival homes closer to 1800 square feet, some of them built as early as 1883 (which makes them practically ancient in the scheme of Phoenix). There is history here. And new chapters are being written every day as urban pioneers invest their time and energy into rehabilitating properties into historic gems. If that sounds like you, you may want to start looking in the Garfields. 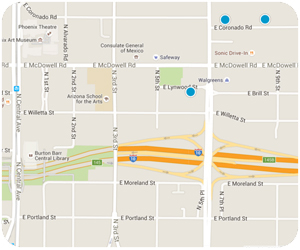 PS Just like the housing choices, restaurant choices in Garfield are all over the map in terms of price and ambiance. First and foremost, though, you must try Rito’s at 907 N 14th Street (weekdays until 4:00) It hardly looks like a restaurant at all, and there’s little signage to let you know that you’ve arrived, but it is worth the hunt for their incredible green chili burro. When you can afford to wait, 5-star Pizzeria Bianco (7th Street & Adams) is worth every minute of anticipation. And when you are in the mood for a bustling atmosphere, head toward the produce department in Ranch Market (1602 E Roosevelt) until you find the cafeteria-style cocina and help yourself tothe watermelon aqua fresca before you get in line to order the very reasonably priced daily special. It’s all good.